Late last year, Qasr Al Hosn, the UAE capital’s most important cultural site, reopened to the public following more than a decade of careful restoration by the Department of Culture and Tourism – Abu Dhabi (DCT Abu Dhabi). The historic gates were once again opened for visitors to experience a celebration of the emirate’s rich history and culture. Performances from Salem Shukri Al Attas, the Soaud Massi Trio Al Ain marked the opening day festivities, with a performance of Memory of an Emirati Song by Khalid Mohammed & Fatima Zahrat. Located in downtown Abu Dhabi, Al Hosn is the original urban block of the city and comprises the Qasr Al Hosn Fort, the Cultural Foundation, the National Consultative Council building and the House of Artisans. Al Hosn is emblematic of the proud cultural heritage of the UAE and brings to life the rich fabric of its history, people and traditions. Qasr Al Hosn tells stories of diplomacy, history and Emirati traditions, as well as those of the men and women who lived in the ruling family palace, complemented by the House of Artisans with its mission to promote and preserve national heritage. The National Consultative Council stands as a symbol of the federation and unity of the UAE, while Cultural Foundation represents one of the early achievements of the young nation-state – its first cultural centre, which became the home of cultural and social life in Abu Dhabi. In 2018, a transformed Al Hosn site was launched as a year-round destination that remains permanently open to visitors and residents, offering unique, immersive and educational experiences for all, including cultural activities such as performances, exhibitions, and traditional crafts workshops. Qasr Al Hosn is the oldest and most significant building in Abu Dhabi. 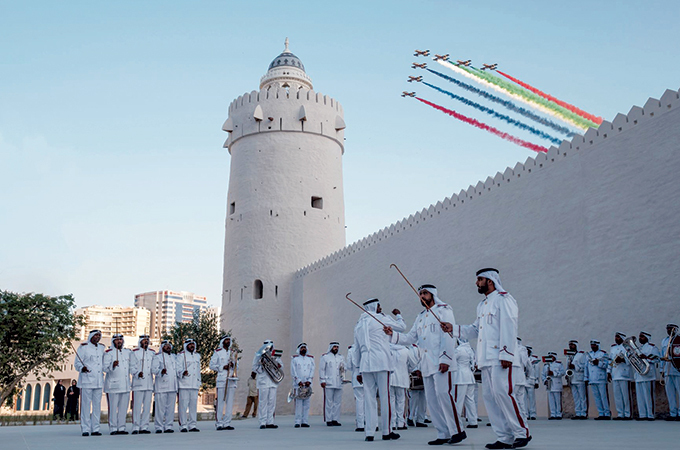 It includes the city’s first permanent structure, a coral and sea stone watchtower built to protect the settlement of Abu Dhabi established on the island in the 1760s. Qasr Al Hosn comprises two major iconic buildings: the Inner Fort (around 1795) and the Outer Palace (1939-41). Over the centuries, it has been home to the ruling family, the seat of government, a consultative council and a national archive; it now stands as the nation’s living archive and the narrator of Abu Dhabi’s history. Transformed into a museum in 2018 following more than nine years of intensive conservation and restoration work, Qasr Al Hosn is a national monument that encapsulates the development of Abu Dhabi from a settlement reliant on fishing and pearling in the 18th century, to a modern, global metropolis, with displays of artefacts and archival materials dating back as far as 6000 BC.